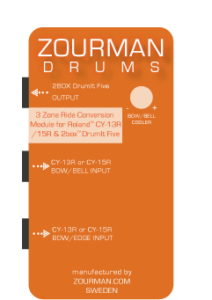 The Zourman Drums Roland 3 zone ride conversion module replaces a standard 2box ride cymbal with your favourite Roland 3 zone ride. The solution is 100% plug and play (only 2box settings needed to be changed) and handles both outputs (bow/edge & bow/bell) on the CY-13R and CY-15R through the two input connectors found on the conversion module. 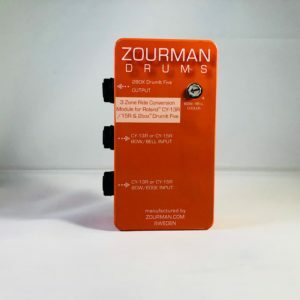 The Zourman Drums electronics and intelligence combine the three+choke trigger signals and deliver the output into a standard 2box 3 zone input (single stereo jack). 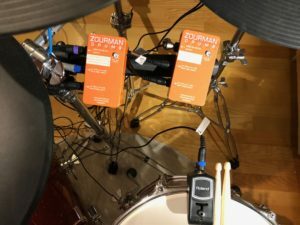 Up to three conversion modules can be used at the same time for 2box cymbal inputs. See the review of the 3 zone ride conversion module in digitalDrummer – March monthly edition. Even ATV’s 18″ Ride seems to work fantastic with this conversion.